Welcome to Pelican's Nest in N. Forest Beach! This beautiful ranch-style home (no stairs!) features an open and updated kitchen with high-end appliances, beautifully chosen colors throughout, updated bathrooms, pool table, gas grill, bocce court and private swimming pool. The beach is a short walk from the front door, and the central location makes it easy to enjoy all of the amenities and activities in Forest Beach and Coligny Plaza. The single-level layout includes four private bedrooms, all with flat screen TVs and private en-suite baths with all new furnishings and fresh paint this spring. The "Peruvian Pelican" master suite features a King Bed and upgraded bath with separate sinks, Jacuzzi tub and large walk-in steam shower. You may choose to relax in your private setting area and enjoy the backyard serenity in the early mornings or late afternoons to unwind. The "Brown Pelican" second master suite features a King Bed, full bath with walk in shower. Set back and enjoy a fresh cup of coffee from your personal coffee station in your suite. Grab a comfy seat inside or on your personal patio for a peaceful start to your day. In the "White Pelican" suite you will find a Queen Bed with full bath and shower/tub combination. Grab a book and relax in your own personal quiet nook. The playful "Dalmatian Pelican" suite will accommodate four guests, with a Queen Bed, Twin over Twin Bunk and beanbag chair for relaxing. The full bath features a walk-in shower. There is also a queen sleeper sofa in a common area of the home. This area is located within the large dining space. A hallway half bath serves as a bathroom for guests sleeping in this area. The living areas of "Pelican's Nest" include an open living room with stunning wood-paneled cathedral ceilings, large leather sofa, flat screen 55" TV and bar stools that settle up to the granite kitchen counter. The updated kitchen includes a center island, stainless steel appliances, Thermador gas range, and granite counter tops. The bar height dining room table seats 12 guests. You will find a game table in the open family space. Located at one end of the large dining area you will find a separate living area that has a Queen pull out sofa with memory foam mattress and DVD player. The main living room leads to a separate room with full-size pool table, perfect for family competitions and skills tests! A laundry room with full-size washer and dryer is available for guest use, as is a private fenced-in area for bicycle and beach gear storage. The private swimming pool is surrounded by privacy vegetation and provides countless hours of recreation and relaxation for guests of all ages. The pool can be heated by "heat pump" for an additional fee. A gas grill is provided for guest use and there are plenty of patio chairs and pool furniture to keep you comfortable in the outdoors! You may choose to relax in the rockers or hammock on the back porch or challenge your guests to a game of Bocce, a wonderfully fun game for all ages to enjoy. Forest Beach is one of Hilton Head’s original beach communities and home to Coligny Plaza, the Island’s “Downtown” with more than 100 specialty shops, grocery stores and outdoor cafes. Forest Beach is home to the Van Der Meer Racquet Club and Tennis Academy, bike trails, and miles of the Island’s most beautiful stretch of beach and coastline. Guests are also close to Hilton Head amenities including golf, marinas with water-sports and Zip Line adventure tours. We love Hilton Head and come every 1-2 years. Destination Vacation never disappoints. It’s nice to know that our needs will always be met. 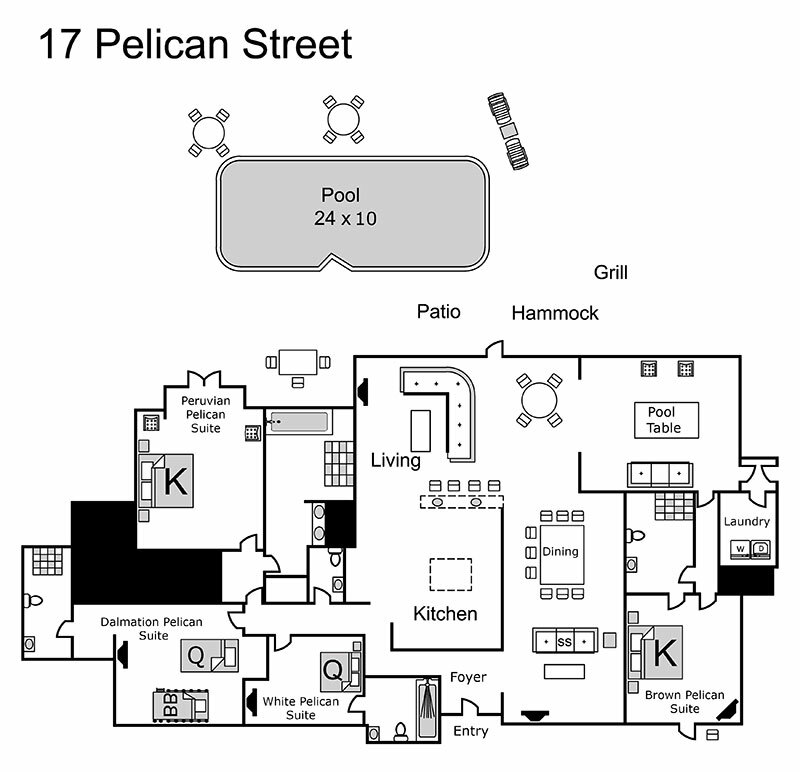 This is the second consecutive year we have stayed at 17 Pelican. It is a beautiful home that is perfect for us. Great kitchen with everything we need to cook and hang out. Dining room is perfect for family meals and game nights. Also love the pool table! We all had our own bathroom, and the bedrooms were well suited for us. Our grand-daughters loved the bunk beds. The pool was great to come back to after a hot beach day. Thanks for a great week! The home at 17 Pelican was wonderful. It is fully equipped with everything we needed...the kitchen was amazing in everything it had. Such a special touch as the owners left us a nice note and bottle of wine. Service by Destination Vacations for any issues while we were there was great. Thanks so much!!! This is our second year staying in the house at 17 Pelican. 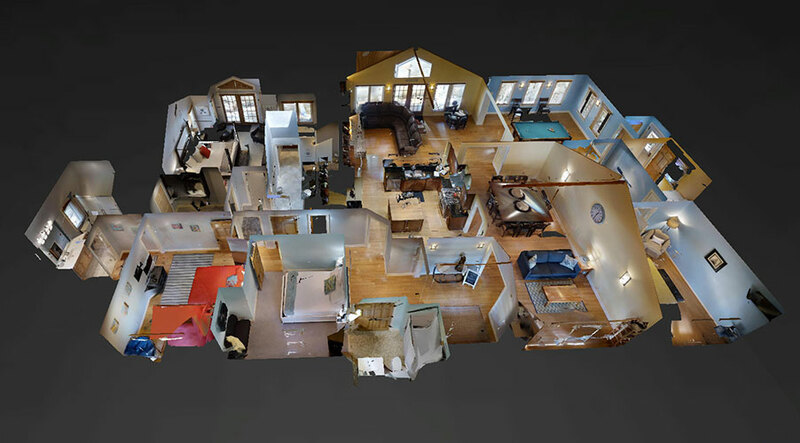 It is an amazing house and comes with absolutely everything you need or could want. It’s nice that each bedroom has their own bathroom with shower so everyone has their own space and privacy. The kitchen is equipped with everything and there’s plenty of space for everyone at the dining room table. The location is also perfect. Close to the beach, shopping, grocery and restaurants. Close enough to walk or bike to all of these places if you desire. The walk to the beach is just a few minutes across the street. When we weren’t at the beach we enjoyed hanging out poolside where there is plenty of seating and lounge chairs. Hello, We loved the house, and the location as well. The house met all of our needs. Grandkids loved playihg in the heated pool. The only thing I would add is to have another trash day when you have a large group. We will come again, and we will book at your place. The rental house was awesome. Had everything we wanted and more. The only thing was the lawn service came and irrigation problems. Two things we thought of as suggestions. One is that the dining room needed more lighting and second the bedroom next to the laundry room could have used additional towel racks. It was a gorgeous house and might consider staying there again or suggesting to friends and family. Booking with Destination Vacation was easy and straightforward. We loved the house...more spacious than the pictures seemed. My family stayed in the room with the bunk bed. If I had to complain about anything, it was that the back bathroom stayed a little too warm. Other than that, no problems whatsoever. The walking distance to the beach was about what we expected...5 minutes with little kids. The rock pile entry to the beach was a little cumbersome with a wagon and little children, but not a big deal. House close to grocery, shopping, and restaurants. Our family thoroughly enjoyed our vacation and plan to return again next year! Manager's Note: Thank you for your comments! We are thrilled that you had a great experience and appreciate your feedback. The Town of Hilton Head should rearrange the rock pile entry to the beach path. In the meantime, there are alternate beach paths every 3 houses in either direction that may be easier to navigate. "Best Kept Secret in Hilton Head"
Beautiful and clean property loaded with all of the amenities you need! Looking forward to returning to the Pelican's Nest!! We had a wonderful time at Pelican's nest! There was a bedroom and bath for each of our daughter's families and great common space for all of us. This home is very close to the beach and we enjoyed the pool in the afternoons. The guys loved the pool table and the kids were able to do puzzles and art work at the huge dining room table. We all loved the kitchen - great for breakfast, lunch and the few evenings we ate in - the outdoor space is also amazing! Its obvious the owners take great care to accommodate the needs of guests. We have stayed at many places on Hilton Head - this is by far the best - coming back next summer! Very comfortable. Perfect for our annual family reunion. And the dining room table was so amazing for family meals!! Thanks. We LOVED the house! The kitchen was fabulous- we took turns cooking dinner and found everything we needed. The bedrooms were comfy, and everyone loved having their own bathroom. The pool table was fun, and the outdoor area was wonderful. Plenty of room to spread out and the pool was welcoming after a day at the beach! The towels, linens and toiletries provided were excellent. The walk to the beach was pretty easy. The only issue was that the path closest to us had large rocks which prevented us from using it because we had beach carts and small children, so we used the next one down. The location was great - nice and quiet. Only exception was one of the neighbors was lighting loud firecrackers at 3 AM. We had the large master (awesome!!) and we were the only ones that heard them. Thanks for a great week! Hoping to come back next year. Manager's Note: Thank you for your feedback! We are so sorry about the neighbor's fireworks. We have never received that complaint but our understanding is that it was related to July 4th celebrations. Sorry for their actions. Our group totally enjoyed your home for our girls' getaway. Loved the privacy of the backyard and the house is lovely. Terrific kitchen with everything you could need. Hope to return in the future! We had a great week! This house was perfect for our large family. Thank you so much for the great memories! Thank you for sharing your gorgeous home with us. It was a beautiful environment to host our family and simply perfect! From the short walk to the beach, the seat in the pool, the gourmet kitchen, lovely decorating and rooms for everyone...we will be back! The home was beautiful and more than satisfactorily equipped in the kitchen. No fault of homeowner but the ice maker kept getting jammed and ice would fall out every time door was opened. I think its a flaw in the unit as our GE ice maker. Ours in NJ does the same thing. Thanks! The home we rented was what we had hoped for and more. The staff were great and answered our questions and request with kindness and professionalism. The home was clean and in good condition. I loved this house. It was our first time to Hilton Head and I couldn't have imagined a better trip. We loved the location and ease to walk to the beach and the ability to relax and swim in our own peaceful pool. I am a believer in Hilton Head and plan to make this an annual trip. A few suggestions on the house. It would be nice to have door chimes and maybe top locks for doors to the patio. I have little kids and was really nervous about them getting to the back yard unsupervised. The DVD player should be moved to the main living room or another one added in there. Other than that I had a perfect trip. Dreaming for next year.